The spherical crystals in the ice particles exhibit good flow properties, which allows for easy circulation through conventional pumps and piping. The small sized crystals flow into crevices and provide greater surface contact and, hence, much faster cooling rates than other traditional forms of ice cooling (flake, block, shell, etc.). Slurry ice can be produced with different density levels, ranging from 10% to over 90%. These different densities produce different chilling efficiencies, making this technology applicable to different food groups and different product types. Slurry ice delivers from 10 to 40 times more chilling capacity than chilled salt water. For example, one liter of 20% slurry replaces over 20 liters of chilled water. Thor-Ice has developed a unique set of technologies for producing, storing, and distributing Slurry ice. These technologies allow efficient and complete chilling of fish, poultry, and meat, throughout the entire food value chain: from harvesting through distribution to consumption. With the Thor-Ice technology, Slurry Ice can be controlled and distributed more easily and productively than ever. That is why the technology has proven to be more effective than any other chilling method — cold air, flake ice, chilled seawater, and traditional ice cubes. The main goal of the Thor-Ice technology is to preserve the quality of the raw materials by reducing flesh tearing and by stabilizing and controlling the growth of harmful bacteria (ie., e-coli or campylobacter). In fisheries the Thor-Ice technologies also reduce the breakdown and effect of krill, preserve freshness, and extend shelf life of all products. Rapid chilling with Slurry Ice gives food producers an opportunity to handle food easier during processing, to reduce labor, waste disposal and energy costs. Thor-Ice chilling technology enables for more economical operations and improves poultry meat texture – another important quality parameter as well. The Thor-Ice technology platform is modular. It is designed to complement existing chilling to yield more efficient results. 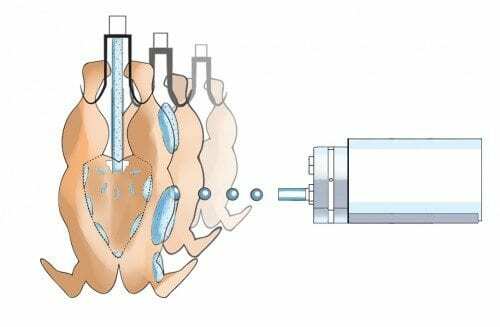 By using special spray nozzles, called IceGuns, Slurry ice is sprayed on the inside or the outside of the product as it passes through production. The IceGuns® are designed to spray slurry ice at the correct concentration, time and temperature to maximize cooling efficiency. The number of IceGuns® and their position are adapted to individual processes and programmed in a way so they provide target results. 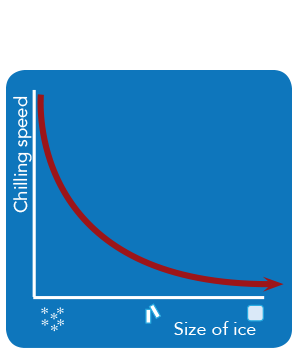 Applying Thor-Ice technology can have significant effect on quality of the product as well cost of chilling. Investment payback is possible to calculate directly from the yield and energy savings. Other benefits, such as extended shelf life, reduced bacteria growth and others, are difficult to calculate and put numbers on, even though they are of great importance. 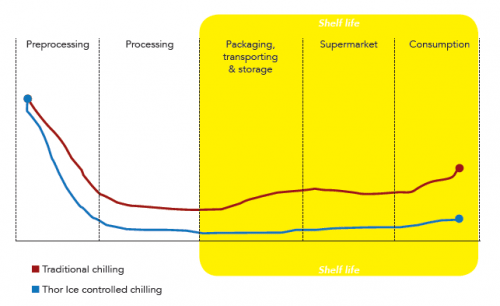 Shelf life is one of the most important factors in the decision to apply Thor-Ice technology, where, for many processors, one day in improved shelf live alone will return investment in less than a year. Rapid chilling of raw material soonest possible after slaughtering or harvesting, keeping the entire production process chilled is essential to preserving freshness of food products. By applying Thor-Ice technology using controlled rapid chilling self live can be extended. Fewer bacteria in the poultry means longer shelf life, preserved quality and better taste & appearance. From the food safety point of view, risk of human diseases is reduced with rapid and timely chilling which is the main goal of the Thor-Ice chilling technology. On the other hand, customers enjoy well preserved, tasty and healthy poultry. Substantial energy savings can be accomplished with Controlled Slurry Ice, depending on the methods used. With Thor-Ice slurry ice technology additional air chilling is reduced which is directly linked to the lower energy consumption. Poultry producers can save when using slurry ice for chilling poultry as an upgrade for water chilling and dipping methods. Furthermore, only 1% in drip reduction could save large amounts per year, depending on the production volumes. Cutting operational costs by preventing waste of energy, water and raw material resources is a solid ground for stable operations in food processing. Thor-Ice technology enables increased product quality in environmental friendly production can only bring in more customers, while management is successfully meeting challenges in today’s economy. Regardless of chilling method used today, whether it is dipping, air chilling and/or combined air & water chilling, Thor-Ice rapid slurry ice chilling technology is possible to use with any method know so far. The main advantage is that Thor-Ice solutions are plugged into the existing systems in a way that they work well with the existing chilling method, while enhancing the chilling results in a timely and programmed manner, in places where lower temperature is required. With the existing methods for chilling, it very hard or almost impossible to make physical changes when more chilling space is needed. Building a larger chilling, with all included is a large investment and in some instances can take a long time. In contrast to that, Thor-Ice slurry ice chilling solutions cost much less, and can be installed without interrupting the ongoing operations. The payback that can be calculated directly is yield and energy savings. Other benefits, such as extended shelf life, reduced bacteria growth and others are difficult to put numbers on, even though they are of great importance. 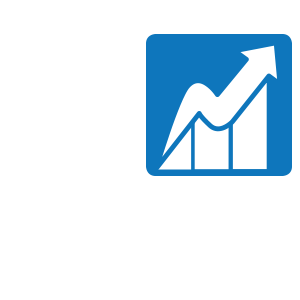 Shelf life is one of the most important factors in the decision to invest in a system like this, where interested companies have mentioned that 1 day in increased shelf life would be enough to pay back the investment in less than 1 year. Increased environmental awareness and strict legislations are pressuring food processors to adjust to more environmentally friendly practices and to reduce their costs. With these thoughts in mind, the Thor-Ice products and services have been designed.